Will Polaris Industries Inc. Raise Its Dividend in 2017? A year heavy with product recalls has taken a toll on profits, but investors will soon find out if it will break a two-decade streak on hiking its payout. Investors will soon learn whether Polaris Industries (NYSE:PII) will break its 21-year record of raising its dividend payment. Last year, it only hiked its payout by 4%, and after the year the power-sports vehicle manufacturer has had, where recalls of its vehicles for "thermal hazards" stretched across almost its entire product line, it would be understandable if it fails to do so this year. What was really burning up was Polaris's profits, which were halved last year to $213 million from $455 million the year before. Because the off-road vehicle market accounts for three-quarters of its revenue, the repeated recalls also took a toll on its bottom line. Yet companies also pay a price if they upend their dividend policy, particularly when they suspend a payout, even if it might be smart to hold off on raising its payout. 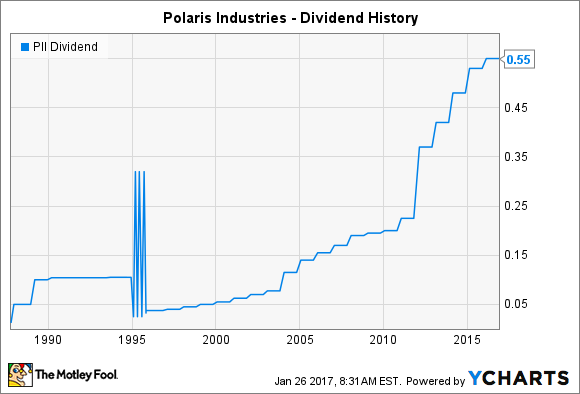 Companies tend to take a dividend cut or suspension as a last resort, so let's look more closely at Polaris to see what investors can expect on the dividend front for 2017. Polaris CEO Scott Wine said the recall issue had turned into an all-consuming problem for the company. While he thought early on in 2016 that they'd gotten the matter in hand, it became apparent as more vehicles were recalled that they had not. And it started off the new year announcing another recall as well, with almost 10,000 Sportsman 570 Touring and X2 ATVs being recalled because of a potential fire hazard. It's about 70% completed with the original RZR recall and 80% through the RZR Turbo one. As those were its two main problems, this should soon be in the rearview mirror, but it remains problematic that they're recurring in different products. While rivals like Arctic Cat (NASDAQ:ACAT) have been able to use the lapses to close the gap between the brands, Polaris remains far and away the industry leader in the off-road vehicle market. Whether Polaris can continue to raise its dividend will depend in large part on whether it is able to successfully grow the business. It seems as though it is eyeing that opportunity judging by a few of the decisions it has made in recent months. First was the acquisition of Transamerican Auto Parts, an aftermarket retailer of parts and accessories for ORVs and trucks. It's a highly complementary business for its powersports vehicles, but also takes Polaris in a whole new direction by making it a retailer with a network of about 75 locations. That's a first for Polaris, and though that entails some risk, the synergistic nature of the operation bodes well. Second was the decision to wind down its Victory motorcycle brand. Although it had been around for 18 years, it had suffered accumulated losses of $100 million and it was unreasonable for Polaris to keep pouring money into the brand. Instead, it will now be able to focus more acutely on its wildly popular Indian Motorcycle nameplate, which continues to see double-digit growth even in the midst of an industry-wide downturn that's more broadly affected rival Harley-Davidson (NYSE:HOG). PII Dividend data by YCharts. Polaris had also pursued a policy of steeper stock buybacks, spending almost $246 million in 2016 to buyback and retire shares. It still has an outstanding 7.5 million shares under its current authorization giving it plenty of flexibility to continuing reducing its share count, though it does say it will also use repurchases to offset equity issuance for management. The power-sports vehicle maker is also expecting operating cash flow to be down significantly in 2017 because of lingering recall and legal issues, but its capital structure is expected to remain largely unchanged. It saw long-term debt surge last year to $1.1 billion due to the acquisition of Transamerican, and it doesn't anticipate taking on any more now. Polaris Industries has a lot of moving parts to consider, but even after this prolonged bout of product recalls, it's not in any financial distress. Although any dividend hike might not be the double-digit rates investors enjoyed over the past few years, they can probably expect to hear very soon whether the company will indeed raise its payout again in 2017.